My schnoodle Victor didn’t like the boat. Then he did. Then he didn’t again, although he learned to balance on the cushions hammered into the bench of our small fishing boat with a hand-controlled two-stroke motor. We’re taking it out today for the first time … with both dogs, Victor and Sasha. Our boating adventure – the first of hopefully many – started at Byng Island Park in Dunnville, Ontario, close to home. Turns out this small boat is ideal for humming up and down the shallow Grand River that cuts through this dog- (and family-) friendly Grand River Conservation Authority holding. We cruised on by the shoreline campsites and anglers, and I don’t worry about falling over. I can stand up if I do. It’s that shallow. First, the huge pool I’m looking forward to seeing in action next visit when it’s open. (May is still too cool). The conservation area claims it accommodates about 1000 people at peak activity, and maybe it does, though I wouldn’t want to be in it then. This massive round swim hole slopes like a wave pool towards the deep centre and diving is possible thanks to a long ramp extending into the middle. Second, Byng Island is all about the water. And that’s why we’re here … to christen the boat that sat in my boyfriend’s driveway all winter. 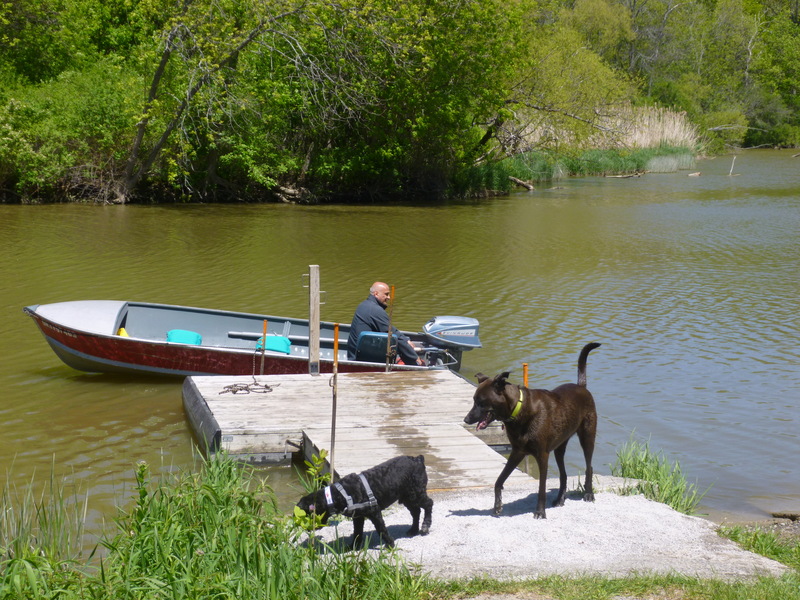 So we selected one of three boat launches – the one below the dam – and piled in: two people and two dogs. The big one, Sasha, loves water and the little one sports a new bright pink canine life jacket, just in case. We’re in the quieter area of the park near the radio-free Sulphur Creek camping area and if we follow the river east, we’ll get to Lake Erie in about 7 km. Fortunately, we don’t make it that far. Victor hits the floor, jumping under the front of the boat and waits while we push the boat loose, feet wet and giant paddles useless. I suggest my boyfriend row the boat back like a gondolier singing to me in Italian the entire way back (He can. Speak Italian that is. Not sing). He disagrees. 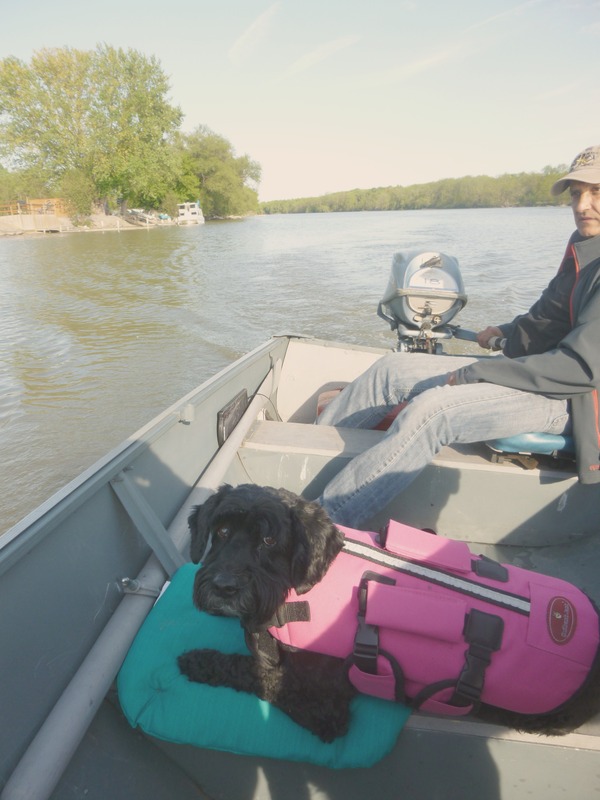 A few pulls of the motor later, and we bunny hop our way over the water and back to the boat launch, a little damper, no dog short and willing to head to a deeper spot on the Grand River to try again. Victor was nervous about the idea but played along. Sasha dove back into the water (several times) seconds after we docked the boat. Maybe next time we rent a canoe. Byng Island Park is located at 4969 Haldimand Road 20 in Dunnville, Ontario and has 380 campsites (134 serviced with electricity and water), canoe, kayak and paddle boat rentals, and about 20 different species of fish in its river. 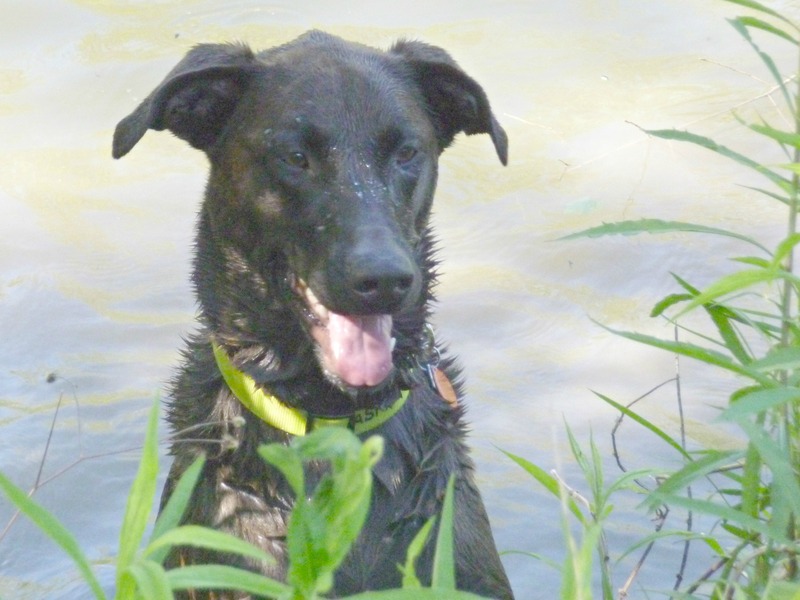 For more information about adventures like this one, check out canoeing with your dog tips.